1/ Users expect a connect between your mobile site/app and your regular site and marketing materials. Granted, you don’t have to be EXACTL Y the same but you do need similarity as more than three quarters of your folks are going to use BOTH FOR THE SAME TRANSACTION. Where is the connect the most important? On all your entry pages, especially your “official” home page. 2. You must know what your users are doing online to achieve any kind of significant conversion to, well, anything. Whether you want inquiries or orders, you need to know what your users are doing with their phones before you start asking for it. Why? Because people who come from Facebook behave differently than people who come from Twitter and people who come from Twitter aren’t at all like people who come from your e-mails and text messages. Granted, this sounds like a ridiculous tip but the truth is that it’s one of the most critical. Why? Because a lot of social media activity is done on smart/feature phones and if that’s the case with your business, that could be the first place you look to get more sales/inquiries. Companies who are interested in mobile tend to overbuild areas in hopes that if “you build it they will come.” That’s ok but it’s usually better to build where the users are first. 3. Onsite search trips everyone up. Sadly, whatever search problems you have on your site will be about 30 times worse on your mobile site. That’s the bad news about mobile. The good news is that if you can streamline some of your issues, your increased conversions will more than make up for it. (So few companies are doing anything on mobile that even if your site isn’t perfect, a little effort will go a very long way.) Your onsite text search will be heavily adopted if your navigation is weak. Therefore, if you want to make your site better without breaking the bank, work on your navigation, especially your jump links. 4. Mobile checkouts need to be more than miniaturized versions of your regular checkout, no matter how perfect your traditional checkout is. Building the perfect mobile checkout is a difficult process and it takes time and a lot of testing to see what works and what doesn’t. While you’re working on it, make sure that you offer lots of alternatives to ordering on the handheld – put your phone number all over the site till you think you have it in far too many places. Then double the occurrences. Same with your e-mail address and any click-to-call or mobile enabled live chat and text messaging options. 5. Abandoned cart programs work like gangbusters. As a rule of thumb, take whatever your performance is on your existing program and then triple it. That’s what you should get from a mobile abandoned cart program. (You’ll get even better results if you include text messaging in your efforts.) Remember, a program includes more than one e-mail (preferably 5-6), pop-ups (midis, catfishes, sidewinders work best), outbound telemarketing efforts on large orders, and so on. 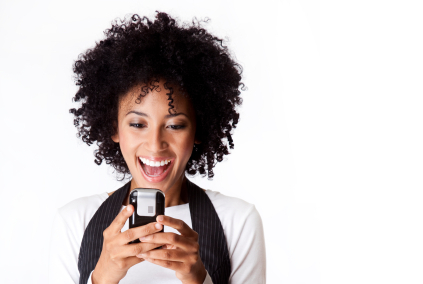 Bonus tip: Speaking of text messaging… It will be one of the best tools in your arsenal. Test it now, before it gets really popular. And, let me guess, the data will tell what we’re doing right and what we’re not doing right! Question for you — I’ve been told that on mobile forms to put all the required fields at the top of the screen so they don’t get missed and so it’s clear what’s required. What’s your take on this, esp. as it relates to checkout?